Imagine a knock at your door. You open it to find the smiling faces of your nurse and doctor. Time for your annual check-up. You sit in your living room. Questions (AKA medical history), physical exam, BP, inspection of your house for hazards, evaluation of your exercise regimine, vaccinations. This happens at no cost to you – just like all medical care. Because it is one of your rights as a citizen. Says so right in your country’s constitution. If you need more, you may go to your neighborhood Health Center (some more artistically appointed than others). If your doctor-nurse team can’t handle the problem, you will be referred to a Polyclinic where specialists serve multiple neighborhood clinics. And for surgeries, transplants, cancer care, etc., to a hospital. If a case of Dengue has been found in your neighborhood, the local Health Department will come to your house and eradicate mosquitoes. in the 1980’s, they created the world’s first vaccine against a very nasty form of bacterial meningitis (Meningococcal B). I recall an outbreak of this disease in Oregon in 1993. The U.S. didn’t have a vaccine for Meningococcal B at the time and was too stubborn to ask Cuba for some of theirs. The Cuban childhood vaccination program is one of the best in the world. Cuba currently exports physicians and medical technology to 68 countries. Cuba’s life expectancy and Infant Mortality rates are equal to or better than in the U.S. while spending one tenth as much per person. How did this happen? We picked the brains of several physicians while there: the dermatologist who was our tour guide (see Numero Tres); an Ob-Gyn who took us to the Oriente and the southern coast; the Family Doctor at a neighborhood clinic; a Tuberculosis and Public Health expert at a Polyclinic; an orthopedic surgeon; and a painter-artist who was also a psychiatrist. But this little kid can get us started. Remember the East? Rural, legacy of slavery, cradle of revolutions since 1868? 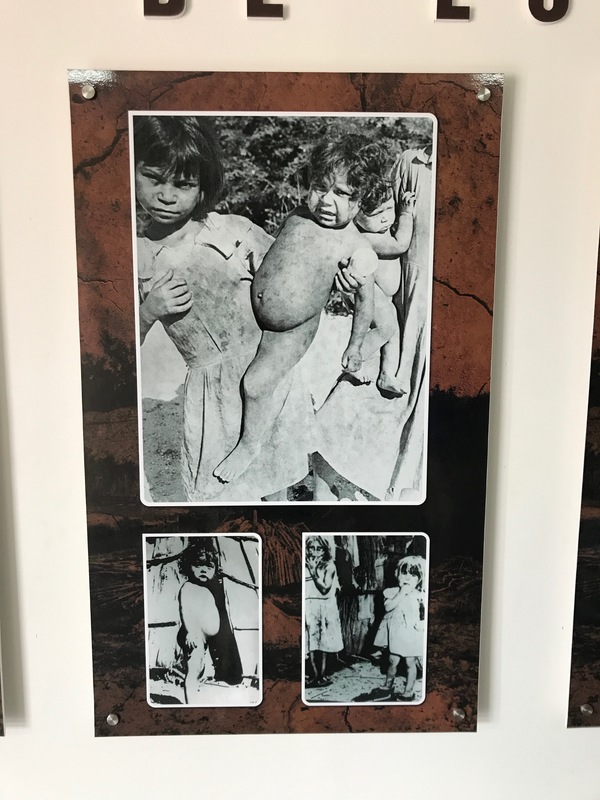 The farmers of this area were illiterate, therefore poorly educated, and so poverty-stricken that children like this were common before the Revolution of 1959: their bellies swollen with parasites, malnutrition and vitamin deficiency. There were 500 childhood deaths a year from tetanus, measles, pertussis and 300 cases of polio. Revolutions to change government are relatively common (the U.S. in 1775; Russia 1917; Vietnam 1946 thru 1975; Nicaragua 1979). But a revolution that changes Health Care – that’s rare. It tells us what Fidel was really up to. And it’s a fascinating part of this most interesting Socio-Political experiment of the second half of the 20th century. How can a farmer who works (in sugar plantations) just four months a year, whose children are crippled by rickets and who has no access to physicians or education be a productive citizen? 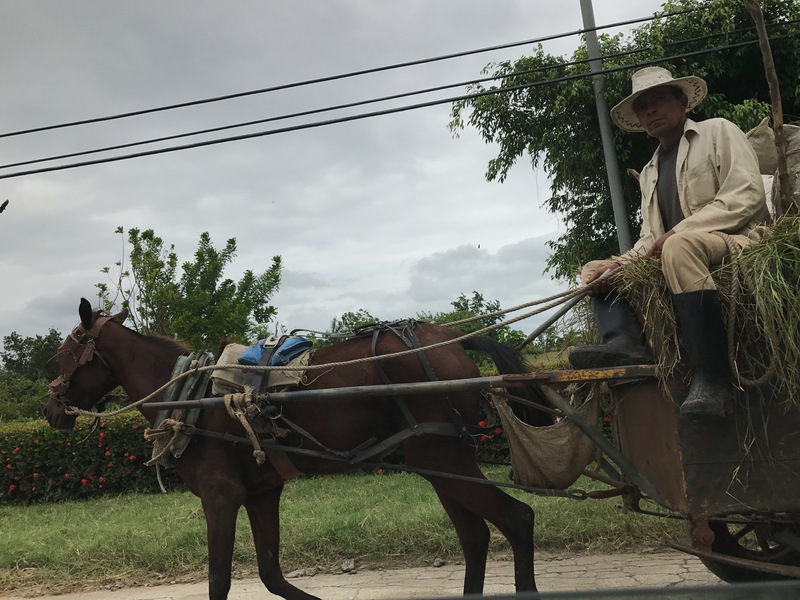 Thus, when the Revolution drove out Batista’s dictatorship, one of Fidel’s first orders was to send an army of teachers into the rural zones and city neighborhoods to eradicate illiteracy. Multiple sources document that, within a year, literacy in Cuba had gone from 60 % to 96 %. This woman of the Oriente told me that her father, a poor farmer, was illiterate and had five children. Since the Revolution, her father can now read and all five kids have attended university. She became a veterinarian. Medical students held raucous meetings, proposed ideas, took votes. 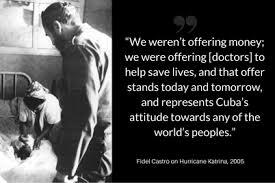 Ultimately, they approached the Revolution’s Ministry of Health which, as a result, created over 300 new positions for doctors in rural Cuba. They created Medical Schools in rural towns, not just Havana. There are currently 25 Med Schools among the country’s 15 provinces. Traditional Medical Education is two years of theory followed by slow introduction of clinical practice. 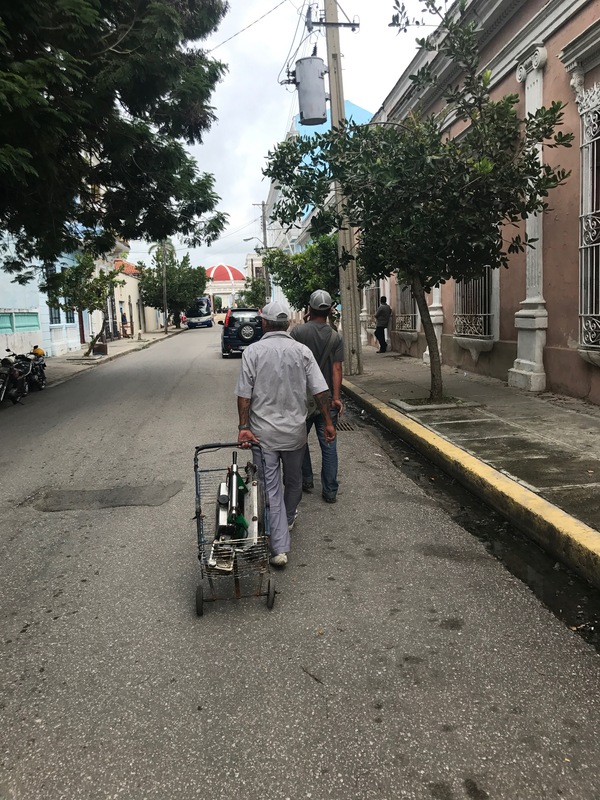 In Cuba they reversed it, locating Med Schools in Polyclinics and having new students begin their education by seeing patients. After six years of Medical education, new Cuban physicians all do Family Medicine for three years. If they want to specialize, they can do so after this Family Med rotation. Each M.D. is teamed with a nurse and assigned 125 to 150 families to care for. People like our swollen-bellied girl now had health care brought right to their homes, both treatment of illness and prevention including immunization. 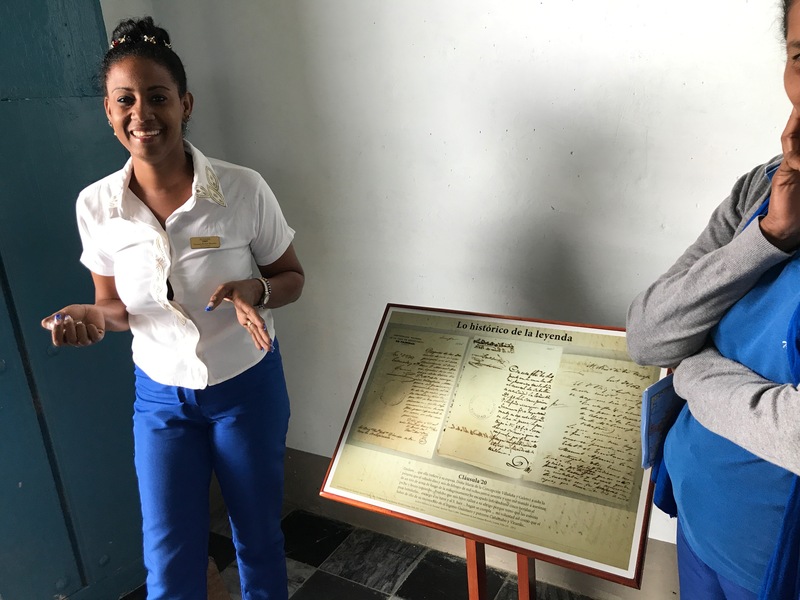 Cuba attracts students from other countries (including the U.S.) to its ELAM school for Medical Education. Cuba hosts international symposia and meetings in various specialties, and Cuban doctors travel abroad for post-graduate training. On the left is Dr. Robot, a member of our group who pioneered computer-aided robotic hip replacement surgery. 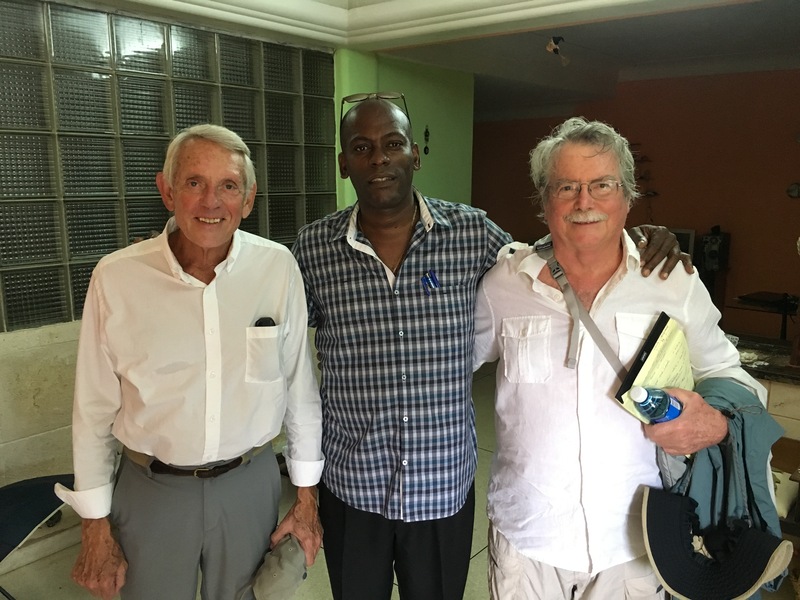 The man in the middle is a Cuban doc who generously gave us some of his time off and revealed a good knowledge of basic orthopedics, but had no access to such advanced technology. Dr. Robot will try to help in that regard. 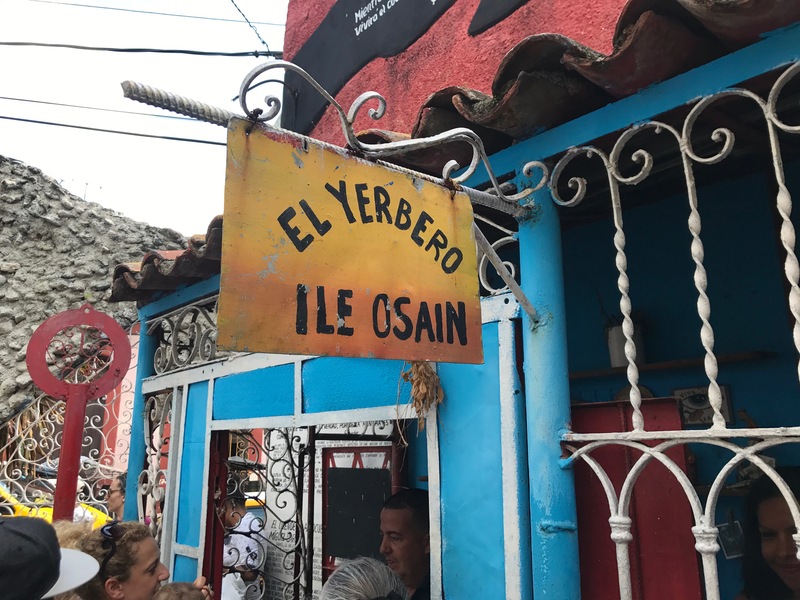 Recall that the free-wheeling capitalist days along the Malecón, with U.S. gangsters, music, and casinos, included a booming prostitution industry. The resultant health ramifications included V.D. and unwanted pregnancy. Changes to the system of Reproductive Health Care since the Revolution include free access to birth control in the neighborhoods where people live, a home for unwed pregnant women which we saw in Havana, legalized abortion, comprehensive free (and compulsory) pre-natal care. The following is a synopsis of Cuba’s approach to the nastiest V D in our times. Three years before the first case of HIV infection hit the island, they forestalled it by banning the import of blood products, destroying all blood products on hand, and screening Cubans who returned from abroad. Cuba is first country in the world to have eliminated maternal-newborn transmission. They have also eliminated transmission by blood products and IV drugs. The island has the lowest HIV rate in all the Caribbean and one of the lowest rates in the world at 0.07%. The U.S. embargo (“el Bloqueo”) which tightened its stranglehold over the Cuban economy in escalating stages, made it nearly impossible for Cubans to obtain insulin vaccines, antibiotics, or anti-cancer drugs from the U.S.
Cima-Vax is a vaccine against Epidermal Growth Factor, created at Cuba’s Center of Molecular Immunology (CIM). Some cancers, including non-small cell lung cancer require EGF to grow. So the Cuba-created vaccine induces antibodies against EGF, starving the n-s-c lung cancer of this needed molecule. Cuba has been using it to treat this form of cancer, with reported success. It holds so much promise that it is now being tested in Japan, the European Union and Serbia. Most notably, a major cancer center in the U.S., Roswell Park, has – in spite of the Bloqueo – obtained it for study. We await results. Nimotuzumab is an antibody of human-mouse origin developed at CIM, which binds with receptors of EGF and is used as an immunotherapy agent to fight certain cancers. 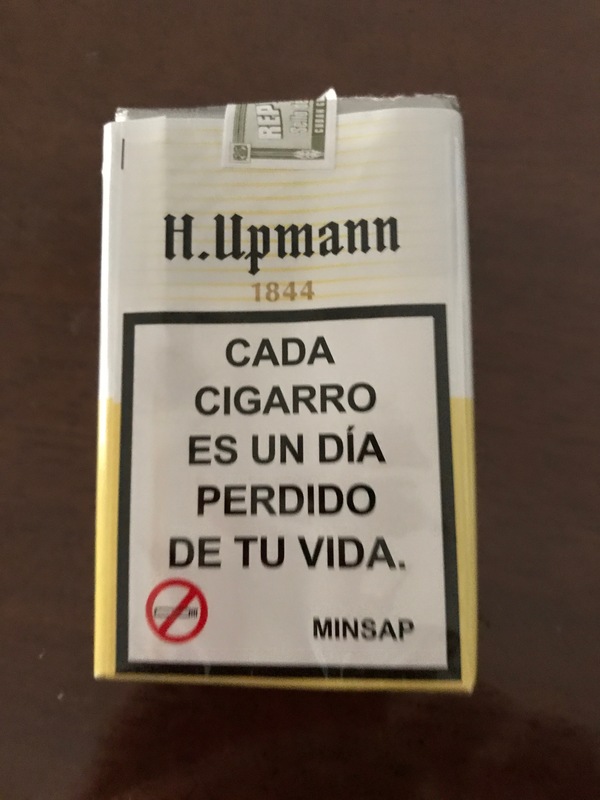 Cuba has granted licenses for it to Europe, South Korea, Japan, India, China, Peru, Brazil, Pakistan, Argentina, Mexico and several African nations. The U.S. treats it as an “orphan drug” (for use in one disease only – in this case, a form of brain cancer). Meningococcal B Vaccine. In the 1980’s, there was an outbreak of a virulent form of meningitis in Cuba, devastating children and teenagers. There was no vaccine against Men-B in the world at the time – too technically difficult to create. Cuba, however, succeeded in developing a vaccine in 1987, conducted trials, then vaccinated every Cuban under age 15 by 1989. The vaccine was so successful, that Brazil, Argentina, and Colombia began using it. It has been proven safe and effective in randomized, double-blind studies. While working as Health Officer, I watched closely as an outbreak of the same disease erupted in Oregon beginning in 1993. The outbreak lasted four years. In 1999 the U S obtained the Cuban vaccine but only to send it to Belgium for testing. Not til 2013 did Europe develop a vaccine against Men-B. Later in 2013, there was another outbreak, this time at Princeton University. The U.S. imported the European vaccine for emergency use. How can a poor country afford all this? It is precisely because Cuba is poor that it has shifted the focus of Health Care from diagnosing and treating disease to preventing it. They still provide the diagnosing and treating, but prevention is much cheaper. The U.S., overwhelmingly focuses on treating illness, and spends 17.6% of its GDP on “Health Care” annually. About $10,000 a person. Post-Revolution Cuba, while it treats disease also, focuses intensely on Prevention, spending 11% of its GDP. About $ 800 a person. The U.S. figure, worse than Taiwan or Poland, varies greatly by demographic group. E.g. in King County (Seattle) the Infant Mortality rate is 3.9 for the entire population, but for African-Americans, it’s 7.1 (about the same as Kuwait or Russia). Years ago, in a hospital in rural Bolivia, I saw a seven year-old boy lying alone in a dark room. “We leave the lights off,” the doctor whispered, “because any stimulation causes muscle contractions.” And at that, the boy’s entire body went into spasm. His back arched so violently, I thought his head would touch his heels. Every muscle in his body was as tight as we experience with a leg cramp at night. Recall that, pre-Revolution, 500 kids died of tetanus or measles or whooping cough each year. Tetanus has nearly disappeared (incidence less than 0.1 per 100,000) The other two diseases are now extinct in Cuba. As are polio, rubella, mumps, and diphtheria. Cuba’s childhood vaccination rate is 95%, one of the highest in the world. Better yet, Cuba produces its own vaccine (necessary because of the Bloqueo) which guarantees a stable supply. A situation Canada lamented that it did not have as recently as 2004. As Health Officer, I recall more than one season when our vaccine supply was compromised because the Pharmaceutical manufacturer had either a contamination in the factory, or was diverting vaccine to higher paying customers. 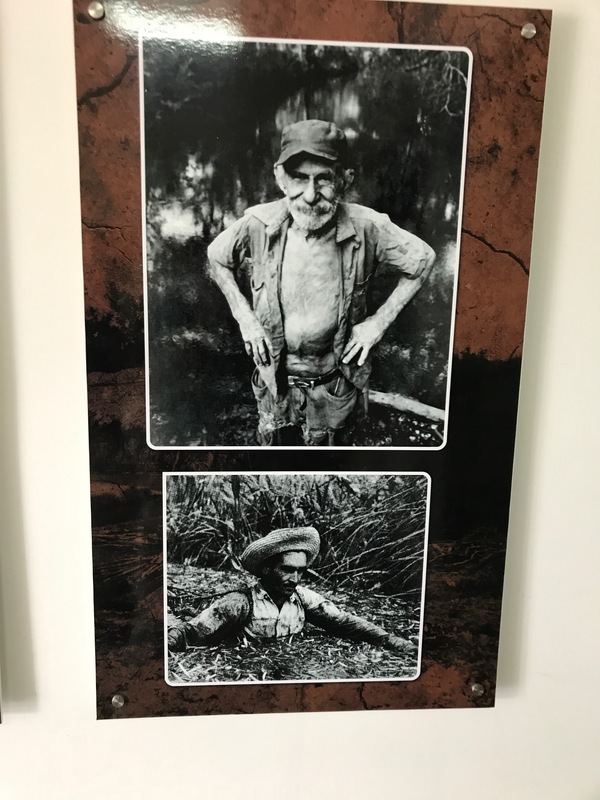 For one period of several months, physicians had to send their private patients to Health Departments for tetanus shots. Hepatitis B is a crippling disease which often kills with cancer or failure of the liver. It can be transmitted to newborns from the infected mother. In 1991, Cuba recorded 2300 new cases. They developed a vaccine at their Genetic Engineering and Biotechnology Center. By 2003, the number of new cases nation-wide was 90. Another measure of the success of prevention: over the period 1980 to 2000, there was a decrease in hospitalization and in hospital out-patient visits with a parallel increase in primary care visits in the neighborhoods. How much do Cuban doctors make? Not much. Just got a raise to $60. A month. Also, as mentioned earlier, access to equipment or expensive drugs (psychiatric drugs in particular, per our conversations) limits their effectiveness in the treatment-of-disease part of health care delivery. 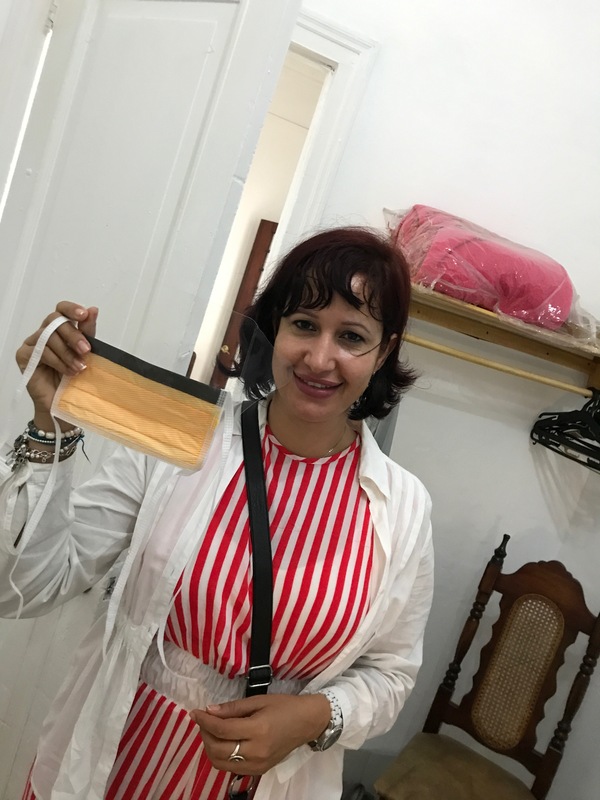 Cuban physicians asked us for such simple tools as face sheids (to protect surgeons from fluid splash) and goniometers to measure the range of motion of joints. Physicians do have access to computers to do research and education, but it’s dial-up and limited in time. 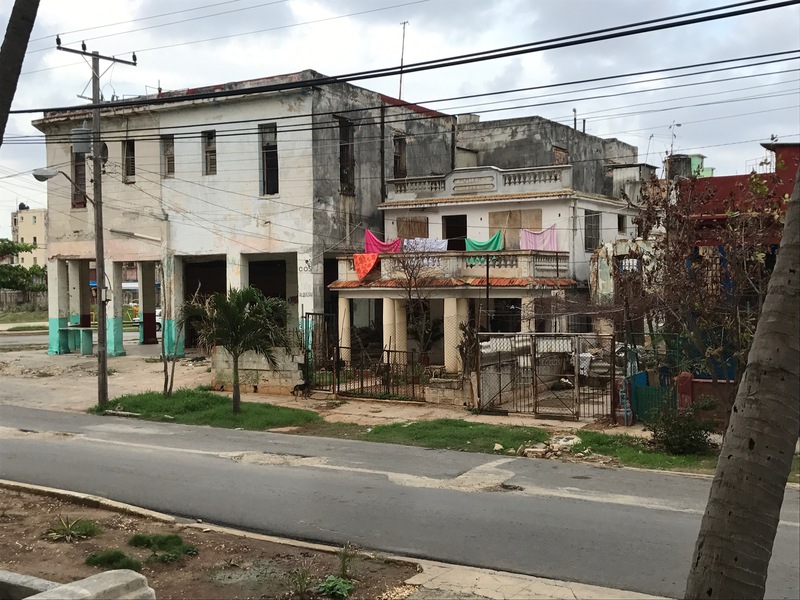 Shocker – Cuba’s health care system actually produces revenue. Their ingenuity and vision created such successful work-arounds to the Bloqueo that Cuba now exports physicians and medical technology. 37,000 Health Care workers serve abroad in 68 countries. I’ve seen them in Bolivia, Haiti, Ecuador. They work under international contracts and generate revenue for Cuba. In the case of Venezuela, Cuba gets oil. And Cuban doctors get paid more when they serve abroad. Cuba is a destination in Health Tourism. 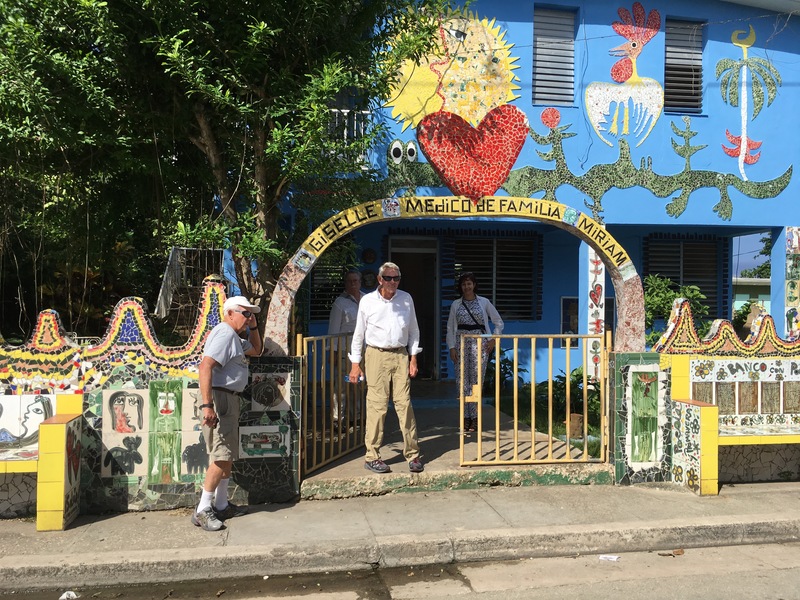 Approximately 20,000 people a year come for health care from Latin America, Europe, Canada, a few from the U.S. Health Education is incorporated into all schools. And Alternative Medicine is recognized and integrated into Cuba’s western medicine model. Just looking out a window, you can see what languishes for lack of resources – streets, building maintenance. But we heard almost no complaints about this. When the hurricane storm surge inundated streets and homes, the people came out to do clean-up themselves. “Success” is measured by income. Almost everyone – including millionaires – believes they don’t have enough. “Insurance” is the vehicle for Health Care (for those who can afford it). 27 million are still without this vehicle. Insurance company profits are a major cost of Health Care, which costs double what it does in developed nations like Canada, Sweden, Germany, France, and ten times what it does in Cuba. And now Trump is trying to sell us that the economy is “national security” to be “defended” by our U.S. military. Back in Cuba, that little symbolic Oriente girl with a swollen belly has had her parasites purged, her rickets cured with vitamins, been vaccinated against the traditional childhood killers, been taught to read, has graduated from the university and gets free pre-natal care. NEXT: Cigars, Beaches, and the Rolling Stones.